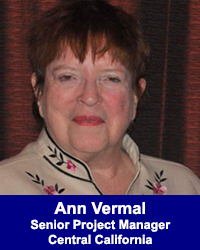 Ann Vermel, Senior Project Manager- Central California - California Consulting, INC.
Ann Vermel is California Consulting, Senior Project Manager in Central California. Ann is is an executive coach and professional writer serving the Community Benefit sector. She has extensive experience in development and executive management of nonprofit organizations, with special emphasis on the arts, higher education and community service organizations. Her background includes service as Executive Director of the Rhode Island State Council on the Arts, Artistic Administrator at the San Francisco Opera and Director of Development for the General Libraries at the University of California Berkeley, Director of Corporate and Foundation Relations for Menlo College and Director of Development for De Anza College. She was a founding officer of the National Assembly of State Arts Agencies, and has served as a grants reader for the National Endowment for the Arts, the National Endowment for the Humanities, the Department of Justice. Since returning to the Central Valley, she has worked with a broad cross section of the Valley’s community service organizations. As a development professional and consultant her leadership has raised more than $72 million for her clients. Ann has an AB from Barnard College and an MFA from California State University Fresno. She has a Certificate in Arts Administration from the Harvard Graduate School of Business and is retired as a Certified Fund Raising Executive. She is currently a fellow of Creating the Future. She lives in Fresno, California.